Thanks for standing bye as I took a 3-day vacation from the blog with my birthday this past Friday. To get back into the swing of things, we need to take a look at the latest Brian Manzella video, the Essential D-Plane video. I believe this video is a mandatory to watch if you're serious about improving your golf swing. This video has been discussed over at my forum (http://richie3jack.proboards.com) quite a bit and one of the posters still didn't understand why Trackman was such a great tool and why not just examine the biomechanical aspects of the swing. I would make the analogy that Trackman is much like a forensics lab. Let's say I'm a detective and I come across some skeletal remains and from my experience I make an educated guess that they are the remains of a male teenager. I could then start searching for missing male teenagers in the area. But instead a detective will take it to the forensics lab, and they may accurately determine that the remains are from a female. Along with determining the approximate age, ethnicity, size, how they were killed, etc. I could then use that *accurate* knowlledge and know where to look and then get back into doing the good, old fashioned detective work to solve the crime. SliceFixer (aka Geoff Jones) mentioned this in an interview with Ralph Perez at the Gotham Golf Blog. He said he had an issue with hitting a low, diving hook and thought he had a problem with his club path. But when he measured his swing on Trackman, he found that his path was fine, but his clubface was too closed at impact. Had he not used Trackman, he may have been doing 'good ole fashion detective work' on curing his path woes which were not there instead of finding a way to cure his closed clubface. Here's some of my latest swings from this week. 7-iron thru LW I'm hitting very well. I'm pretty good with the driver and hitting the 3-wood extremely well. The 3-iron thru 6-iron is probably my biggest struggles right now and I'm more inconsistent with them and have some issues with hitting them a bit too low. I'll be playing Orange County National on Friday. Yes, THAT Orange County National (www.ocngolf) where they are holding the Q-School finals this year. I'll be playing the Q-School tees. The goal for me down the road is to get into the 60's and under par from the Q-School tees on a consistent basis because that's the level of play needed to get to match play of the US Am (IMO). I'm thinking right now, probably looking at a mid 70's score at OCN, but we'll find out tomorrow. 3Jack Top 50 Instructor Gregg McHatton on arm travel in the backswing. Here's a nice video from 3Jack Top 50 Instructor, Shawn Clement (www.shawnclementgolf.com) on the golf swing and viewing it from the top view. There's some differences in Shawn's swing philosophies from mine, but he has an effective and interesting take. I've been asked about the 'shorter swing = more distance' topic that has been recently discussed. As I've discussed in a few of the previous posts, one thing I'm working on is shortening the backswing and I've found that I'm actually gaining distance with a shorter swing. Here's a Face On view to show the differences in backswing length. For me, the longer swing gets me laid off at the top and then it throws the downswing off and I don't get as much angular momentum into the ball. Here's a video shot by blog follower gmbtempe of U. of Arizona Golfer, David McDaniel. David hit this 9-iron, 160 yards, with that swing that only went back to about '9 o'clock'. Why? Because his impact conditions are superb. Now, I hear a lot of people saying that they need to shorten their swing to hit the ball more accurately and more consistently. I don't agree with the notion that a shorter swing will guarantee more accuracy. Here's a video of Sam Snead, one of the all-time great ballstrikers, in his prime. And if you want to hit it super long, you won't see any Re-MAX long distance driving competitors with a '9 o'clock' backswing. But, there's more to playing 'real golf' than hitting it long. And one can hit it long and more accurately and more consistently, with a shorter backswing. That's certainly a possibility, you just need to find out what works best for you. After my latest swing update, people started asking me more about the changes that were made as this came after my 1-day school with 3Jack Top 50 Instructor, Dan Carraher (aka iteachgolf). Here again is the swing. Of course, with iteach's affiliation with the Stack and Tilt golf swing, I got some e-mails wondering if I was going to the S&T, why and what I thought of it. My feeling is that my swing is about as S&T as it's ever been since the 1-day school. I know many are critical of the S&T, even myself in the past. One thing I feel that needs to be cleared up is that my swing is still far from being the S&T. But I also feel that the thoughts the S&T pattern is not very dynamic is hogwash. Let's take a look at Charlie Wi. In fact, I believe that is something that Sean Foley has done with Sean O'Hair. Awhile back there was a golf magazine article that had O'Hair go over the changes he made with his swing with Foley and they were pretty much exactly what the S&T teaches. If that wasn't enough, it's common knowledge that Foley has talked to Plummer & Bennett on quite a few occasions to get their thoughts on the swing. But, O'Hair has pretty much denounced S&T and every critic buys into that, but the reality is far different. Anyway, one thing I'm a bit skeptical about is leaning left in the backswing. I think some can do it, but some can't. Then again, the S&T people will tell you that the swing is about being 'centralized' in the backswing and leaning left in the backswing is optional. One thing I've learned is that this type of swing or swings that is similar to it (or whatever you want to call it) is incredibly easy and simple. However, therein lies part of the problem. We are taught to make a big full turn in the backswing and raise the arms. But here that may not be the best option for the golfer. In fact, on of the problems I have with my swing in those videos is that the swing is a bit too long, even though I tried to feel like I was only swinging halfway on the backswing. But we know that the 'feel isn't real' most of the time, so that's why my swing goes well beyond 1/2 way back. But when I 'do it right' the swing feels almost ridiculously simple and easy. And a big part of me fights against that in the downswing. So what would I say about the S&T? It's a dynamic golf swing when executed correctly. It's also very easy and simplistic to do. Thus, it's a very easy and simplistic way to create a dynamic swing. Is it the most dynamic swing out there? Certainly not. 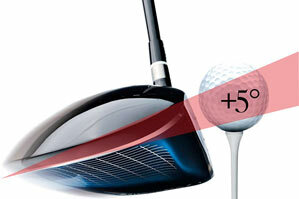 You won't see any S&T patterns in the dynamic swings on the Re-MAX long distance driving tours. Are there other ways to have dynamic swings? Certainly. Is the S&T for everybody? Of course not. So, the S&T may not be the most dynamic or the only way to have a dynamic swing, but it's an incredibly simple and easy way to develop and dynamic swing. Here's the latest swing update with changes that were made after the 1-day iteachgolf (aka Dan Carraher) Orlando golf school. like the second DTL swing better. Believe it or not, I'm trying to not have such a long backswing and it really feels like I'm only taking it halfway back, but obviously it's going further back than that. Another big key for me is to keep the right shoulder going downward and forward on the downswing instead of going down a little, then across and forward. 3Jack Top 50 Instructor and co-founder of the S&T, Mike Bennett, showing how it's done. Great video for so many golfers, particularly beginners....NO DIVOT UNDER OR BEHIND THE BALL! Here's a very good video done by 3Jack Top 50 Instructor, Shawn Clement, on the flop shot. One thing should be noted, in the past almost 2 years since I've started the blog I have asked about a dozen current and former PGA Tour pros on hitting pitches and short game shots and most of them were not big fans of hitting the flop shot. Because ideally they want to get the ball on the green and rolling as soon as possible in the flight and roll of the golf ball. That's why the Rule of 12 chipping method appealed to me...it gets the golfer the right club to hit good shots by getting the ball on the green and rolling as soon as possible. I find the issue with trying to carry the ball more is that it's more difficult to hit the spot if it's further away from you and there's other factors like controlling the spin. But, some people have had such good success with it, like Hubert Green, that using a SW is all they need. Raymond Floyd is also considered with Green as one of the greatest chippers of all time and he used a bunch of different clubs. Mickelson was a lot like Green and usually sticking to a SW or a LW, but eventually has changed to more of a Rule of 12 method. Either way, if you're using the flop shot a lot, you're either using it too much or you're hitting a lot of poor approach shots into the green. One question I've received is *why* the Attack Angle will effect the path. Let's revisit with the attack angle is. As the diagrams above show, attack angle is measured from the face on view and it's the angle of the clubhead coming at the ball. The problem is that when you hear somebody talk about 'coming down too steep', they often mistake an upright downswing plane (aka 'coming over the top') with the attack angle. In Trackman terms, the downswing plane is the 'vertical swing plane', but downswing plane will suffice. But that and attack angle are two entirely different aspects of the golf swing. What we know is that if you make your attack angle steeper (for instance, a -3* attack angle becomes a -6* attack angle), that steeper attack angle will shift the path more inside-to-out. 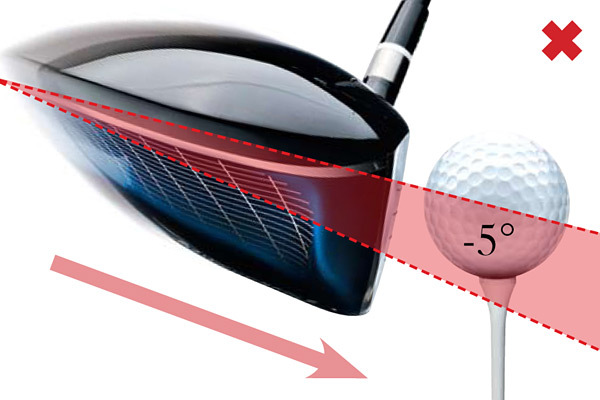 If the face is square to the target at impact and you have now made the AoA steeper, you're going to hit a draw. Conversely, if you shallow out the attack angle, the path moves more to the left. The Geometry of the Circle. Technically, the swing does not move in a circle. But it moves in something that somewhat represents a circle. The bottom of the circle is the lowest point the clubhead will be at in the swing. And as you can see, the low point is opposite approximately where the left shoulder is. So, BEFORE the low point, the clubhead is moving downward. Before we go further, let's think about how that knowledge should apply to how we hit golf shots. With irons, we hit DOWN on the ball. So, we can deduct that if the clubhead is still moving downward BEFORE it reaches the low point, then we need to have the ball BEHIND the low point at address so we can hit down on the ball. Thus, when you hear about 'moving the low point forward', it's basically trying to get the golfer to hit more down on the ball. With the hacker, it's an attempt to get them to stop flipping at impact and to get them to compress the golf ball better. But with the more advanced player, it's usually to get them to hit the ball lower. With the driver, we *can* hit up on the ball if we choose to. This is a great way to pick up distance off the tee. If we want to hit up on the driver, we need to find a way to get the low point behind the ball. Why? 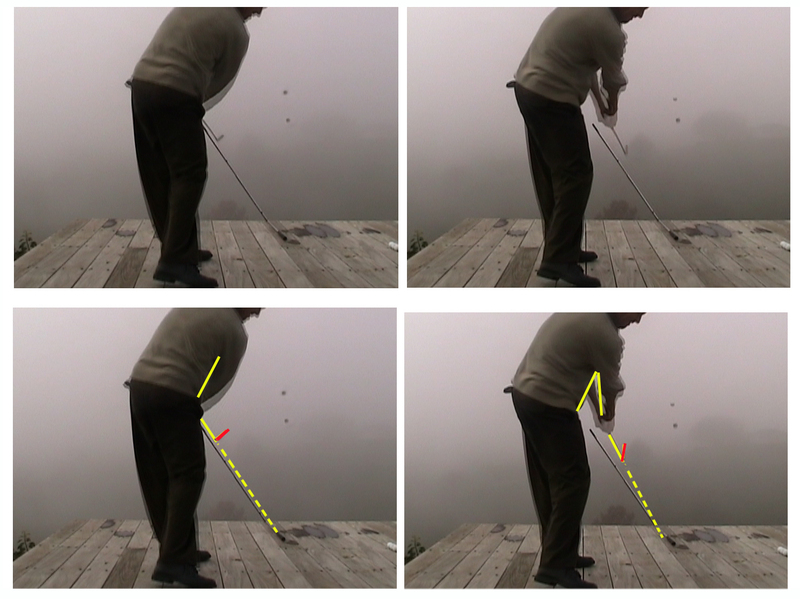 Because after the clubhead reaches the low point, it moves upward. But getting back to how and why the AoA influences the path, remember that we swing on an inclined plane. If the ball is located before the low point, not only will the clubhead go downward after it hits the ball (until it reaches the low point), but the clubhead will also go out to the right (if you're a righty). On the flip side, if you hit up on the ball, that means the low point is behind the ball. So not only does the clubhead reach the low point and then go upward, but it goes leftward as well. If you want to hit upward and hit a draw, which goes against the 'natural way' of hitting up on the ball, you'll need to get the clubhead pointing near the target at impact and get your 'circle' pointing out to the right. If you want to hit down on an iron and hit a fade, which also goes against the 'natural way' of hitting down on the ball, you'll need to get the clubhead pointing near the target and get your 'circle' pointing to the left. Saturday I will be attending a clinic with 3Jack Top 50 Instructor Dan Carraher (iteachgolf) and we'll see how that goes. Lately I've been striking the ball pretty well, but there's always room for improvement. I was asked the other day about my experiences playing competitive golf at 6'4" tall. This is an excellent question. When I think of tall golfers, I usually think of Phil Blackmar (6'8" video above), George Archer (6'6"), Nick Faldo (6'4"), Ernie Els (6'4") and Phil Mickelson (6'4"). Knudson was probably over 6 feet tall and he seemed lanky, but I don't now his exact size. But, one thing you notice is that in general, golfers are short. I'd say the majority of PGA Tour golfers today are under 6 feet tall and for professional sports in today's world....that's pretty rare. One big thing you notice is that the taller the 'good' player, usually the more they flex their knees at address. It's like there's a certain type of height good players want to be at address and the shorter eight players want to stand up more to get to that height and the taller players want to flex their knees and hunch over more to get to that height. Another thing about being a tall golfer is that you have bigger 'moving parts.' And when a big part moves out of position, it just seems like it can throw everything out of whack very easily. I know Faldo, Blackmar, Els and Mickelson have worked tirelessly over the years on their swing because when things go wrong, they really go wrong and then it's a lot of work to get things corrected. Taller players tend to hit the ball further because the radius of the swing is longer, so the clubhead speed will increase. However, I find it difficult to move the low point forward and thus the attack angle shallows out and thus you're likely to hit the ball higher, which can cause problems playing in the wind. Putting is nice because you can just take a 35" putter and address it with your arms hanging down naturally. You can do that if you're a short golfer as well, but now you're fooling with the weight of the putter and the flex of the shaft if you decide to cut the putter length down. I think footwork becomes even more important when you're taller because it's harder to lower the Center of Gravity on the downswing. Lastly, just because you're tall doesn't mean you need upright lie angles. Here's my latest swing. And that's with lie angles about 6* flat. In fact, if you want to 'swing left', I think the worst thing you can do is play with clubs more than 1* upright. 3Jack Top 50 Instructors Dana Dahlquist and Dan Carraher discuss the proper way to learn how to draw the golf ball. Here's a sample Scotty Cameron Putter fitting. Personally, I wasn't impressed with this fitting. While collecting Cameron putters is a nice hobby if you can afford it, it certainly doesn't make you a better putter. Nowhere in the fitting did they check to see if the putter Spencer was using 'fit his eye' and he could aim it straight at address, naturally. IMO, that's a huge aspect of a putter fitting and buying a putter, period. And I also believe that aiming woes can cause those putter issues. According to David Orr (www.orrgolf.com) his studies show that 54% of the golfers aim left of the target from 6 feet away. My guess is that Spencer does as well and that's a big reason why he cuts across the ball, to get the ball to the target even though he's aimed left of the target at address. If I owned a pro shop that sold putters or managed a golf store, I would buy a laser gadget and offer free aim fitting for golfers so they could find the putter that they aim best. Here's a couple of swings with a Hogan Bounce Sole 1+ 6-iron. I reverted back to more of my old posture because the 'new posture' was screwing up my footwork and causing me to spin out. I also had to work to get back on the elbow plane in the downswing again. 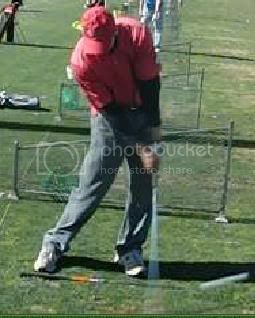 The backswing looks much better and overall the swing is getting there. 3Jack Top 50 Golf Instructor, Ted Fort (www.mariettagolfcenter.com), showing how you really improve a golfer here. First let's give a brief overview of the CP Release vs. the CF Release. The CP Release has the upper arms 'packed into' the body past impact. It's called 'CP' which stands for centripetal force. The CF release has the upper arms off the body past impact. The CF stands for centrifugal force. Here's Hogan and Knudson, both users of the CP Release. Here's a slow mo video of Ricky Fowler, a classic 'CF Release' golf swing. Now, do I think the modern player CF's more these days than players of the past? Yeah, probably. I'd like to get a little more solid facts on this, but I guess so. When I think of modern day CP Releases, I think of Hunter Mahan, Matteoo Manassero and a few others, but that's about it. But, if I go into the past there's Snead, Hogan, Charlie Sifford, Knudson, etc. The main premise behind why I think this is the case is due to the modern equipment, particularly the driver. I can CP release the heavier and shorter clubs, like a 9-iron, much more easier than I can with a 3-iron. And today's drivers are about 45 to 46" in length where the standard persimmon driver was 43.5" in length and much heavier. It's just very difficult for most golfers, including myself, to CP Release a modern day titanium driver. I played some persimmon woods as a junior golfer and currently own a set of Cleveland RC85 persimmon woods. One thing you'll notice right away is that the likelihood of hitting a sky ball increases DRAMATICALLY with persimmon. With the titanium driver...I can't remember the last time I skied a driver. What we know is that the more inside-to-out the path, the more likely it will shallow out or make for an upward attack angle. I think that the modern players hit more up on the driver simply because the modern driver takes the sky ball factor out of play and thus ingrains more CF Release actions. Another factor is the snap hook. With the persimmon, the golfer is much more likely to hit a snap hook. Particularly if they just miss off the toe. We do know that inside-to-out swings usually result in more mis-hits off the toe. So with the modern driver, where you can hit a shot well off the toe and still be down the middle of the fairway, that IMO is more likely to encourage a CF release. Furthermore, when you look at Hogan...I think it's obvious that he worked on 'holding on for dear life' with his swing for awhile. In fact, Trevino recently stated that he learned to 'hold on for dear life' after watching a Hogan clinic and the rest was history . That 'holding on' is really an angled hinge...part of the CP Release...and I think these guys figured out the 'swinging left' and CP release stuf as they went along, both in hopes to rid themselves of the hook. After much deliberation, I came up with my 2nd Annual Top 50 instructors. Here's my first annual list, which I would still recommend each instructor. So I came up with my own list which is hardly scientific. I did not put them in order, just 'my top 50' and it's based upon teaching ability, perception of student success, my perception of their knowledge of teaching, etc. The only requirement is that they must get paid for golf instruction. They do not need to make a living doing it, but they must get paid for their instruction services. Hopefully this will open the eyes to some golfers on instructors out there and the process will get better as the years go on. Here’s a video of Stack and Tilt co-founder, Mike Bennett, excellent foot action. Before I go on though, it should be noted that like anything with the golf swing, there’s plenty of ways to operate your feet and there’s plenty of cases of great golfers with footwork that is a bit ‘questionable’ to say the least. But this post is in hopes to explain footwork, what I think good footwork looks like and how it can help a golfer’s game. Let’s first look at footwork as a chain first. I think it’s safe to say that most golfers, regardless of their knowledge of the golf swing, can understand the importance of how the hips pivot and move in the golf swing. But what most golfers don’t understand is how faulty footwork can actually effect how those hips pivot. And then what happens is that they focus on the hips or they focus on something else like their swing plane and how their arms and hands move, all the while their footwork is the problem. Another part of the footwork, although this is more to do with the knees, is using the ground to push off with which helps better power the pivot. 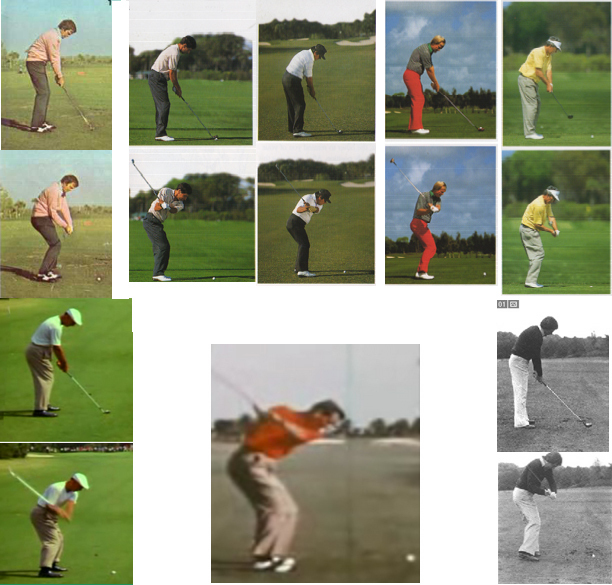 This collage by John Erickson (www.advancedballstriking.com) shows golfers getting more knee bend at the halfway point of the downswing than they had at address. This ‘ground forces’ is something that the S&T guys talk about as well. And for good reason because if you ever watch the Fox Sports show ‘Sports Science’, they discuss ‘ground forces’ being used in every sport. In fact, imagine you were hitting a golf ball off a sheet of ice with sneakers on. Now, would you hit that ball further than you would if you were on grass with cleats on? Now, there’s obvious balance issues as well here. But, if you can push off ground you can better power your pivot as well. You don’t see baseball hitters swing with locked or straight knees for the same reason, it wouldn’t power their body rotation very well. The other part that the feet can effect are the spine and the cranium. The other way it can effect the spine is in the opposite way. If your foot action is flawed, the golfer can ‘spin out’ and get the hips rotating too fast and the golfer doesn’t get enough spine tilt on the downswing and comes over the top. So, what do I think is good footwork? So, from a basic level I look at what the hips and knees are doing. Is the rear knee kicking towards the ball? 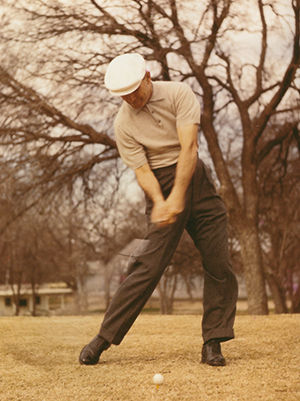 (Moe called the rear knee kicking towards the ball ‘bogey golf’). Are the hips rotating too fast? Are we getting too much or too little axis tilt on the downswing? If not and that’s not a problem, then the footwork is working for that particular golfer. I also tend to look at the golfer’s power in general. If they don’t have a lot of power, but are very accurate I would probably take a look at their footwork. I think this is probably the big reason for Brian Gay’s lack of power. Without giving away teaching instructor’s lessons away, let’s take another look at Mike Bennett’s footwork. Also, take a look at George Knudson’s foot action. I will say this about the footwork. - Try to feel like there is some gripping of the ground with the feet. And remember that your right heel should be ‘pulled off’ the ground and not ‘pushed off’ the ground. Well, in order to ‘push’ the right heel off the ground, one needs to get the weight up on the toes and push the heel off the ground. We don’t want that. Remember though, the ‘posting’ up on the straight lead leg at impact is not advisable in my book, unless you want to come over the top and hit slices. Instead, the left knee should be flexed at impact. But, AFTER impact the leg will become straight and that will get the rear heel up off the ground. Now, the golfers with pretty good footwork who have a rear heel up off the ground, those golfers have a flexed left knee at impact, but it’s just a bit straighter than say a Moe Norman or a Kenny Perry at impact.